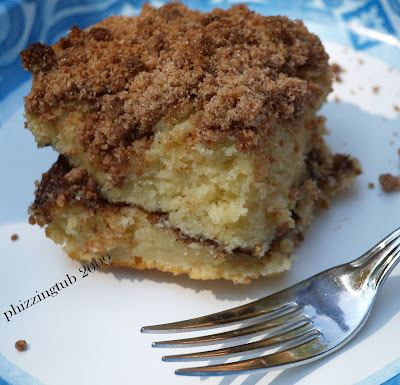 Coffeecake is one of my food weaknesses. I enjoy love trying new recipes for this wonderful mouthwatering breakfast treat. I stumbled across this recipe on the King Arthur flour website late last year. I printed the recipe out, tucked it away in my want to try recipe folder. Last weekend, I wanted something good and ready to try a new recipe; I knew exactly which one I was going to try. The recipe is very easy to follow and the results are well, perfect. Preheat the oven to 350 degrees. Lightly grease a 9 x 13 inch pan or two 9 inch round cake pans. Filling: Mix together the Splenda brown sugar, cinnamon and cocoa powder. Set aside. Cake: In a large bowl, beat together the butter, salt, sugars, baking powder and vanilla until well combined and smooth. In a separate bowl, whisk together the sour cream or yogurt and milk till well combined. You don't need to whisk out all the lumps. Pour/spread half the batter (a scant 3 cups) into the prepared pan(s), spreading all the ay to the edges. If you're using two 9 inch pans, spread 1 1/3 cups batter in each pan. Spread the remaining batter atop the filling. use a table knife to gently swirl the filling into the batter, as though you were making a marble cake. Don't combine filling and batter throughly; just swirl the filling through the batter. Bake the cake until it's a dark golden brown around the edges; medium- golden with no light patches showing on top, and a toothpick or cake tester inserted into the center comes out clean, about 55 - 60 minutes for the 9x13" pan, 50-55 minutes for the 9" round pans. When pressed gently in the middle, the cake should spring back. Per Serving: 296 Calories; 10g Fat (30.5% calories from fat); 4g Protein; 47g Carbohydrate; 1g Dietary Fiber; 51mg Cholesterol; 262mg Sodium. Exchanges: 1 1/2 Grain(Starch); 0 Lean Meat; 0 Non-Fat Milk; 2 Fat; 1 1/2 Other Carbohydrates. Ingredients are broken down into Filling, Streusel Topping and Cake in that order. An EXCELLENT coffee cake, srsly one of the best I have ever made.